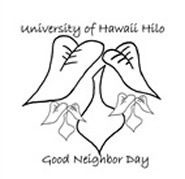 Good Neighbor Day is a fun way for gaining understanding and appreciation for others. It also builds self esteem by helping community members and organizations around the island through volunteer work and donations. If you are interested in volunteering with your fellow students, in the Hilo community, then this is a great event for you!